Our President, William Kocken, will be attempting to break the existing Guinness World Records for ‘fastest marathon carrying a 100 lb. pack’ at the Cellcom Marathon in Green Bay, WI on Sunday, May 20th, 2018. The current record is 6:47:03. He will be carrying the 100 lb. 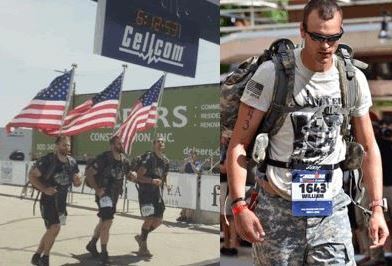 pack for the 26.2 miles in boots to honor all Veterans, past and present. Well the 100 lbs is new territory for him he has completed this race the last 2 years with 40lbs packs and also completed the Madison Ironman with a 50 lb. pack. He is doing this to help raise funds so that we (4th HOOAH WI) can continue to help our local veterans. Show your support by attending this event in person to cheer him on or donate below! If you have questions, or would like to inquire about sponsorship, please contact Will at: wkocken@hooahinc.org.